Iowa State opened the college football season with a 34-17 win over North Dakota State in Ames Thursday night. The Cyclones went 81 yards in nine plays and scored a touchdown on the opening drive of the game, but seemed to struggle at times on offense and defense. I.S.U. Coach Paul Rhoads says it wasn’t pretty. He says most first games aren’t pretty no matter what side you’re on, but says they are prettier when you win. The Cyclones gave up 210 yards rushing, and despite that, Rhoads thought they improved on their tackling from preseason. He says they did tackle, although they missed a couple of critical tackles that led to big plays. Rhoads says some of their big plays were through big holes and they have to work on that. Rhoads says North Dakota State didn’t give up despite trailing the whole game. It was a return to Iowa State for Rhoads and his first win as a head coach. 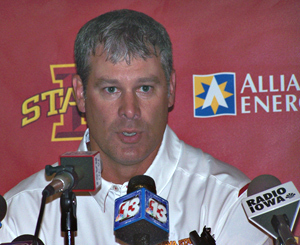 "It’s special to win a football game as a head coach and to do it here, yeah, it was a fun night," Rhoads said. Quarterback Austin Arnaud says breaking a 10 game losing streak was big. Arnaud says it was good to get the win but they made a lot of mistakes and he says he personally did not play as well as he thought he would. Arnaud says the offense was able to get points when North Dakota State scored and looked like they might come back. He says it was huge to do that as they want to score every time they have the ball, and they responded every time the Bison scored. The Cyclones next face in-state rival Iowa next Saturday in Ames.